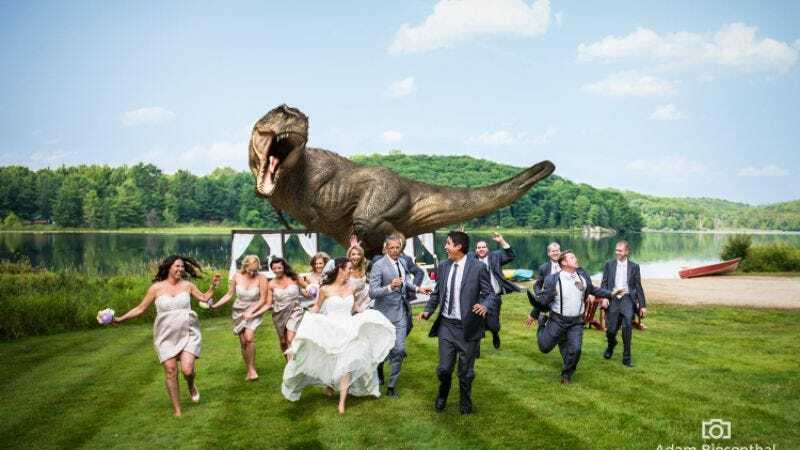 You might remember a photo that made the rounds last year, of a wedding party fleeing from a digitally added Tyrannosaurus Rex. The photographer who put that picture together had a lot of things going for him: A couple who was game for some fun. A passing knowledge of Photoshop. A spare picture of a dinosaur. But he clearly lacked the one thing that would have made the image perfect: a Jurassic Park cast member. Photographer Adam Biesenthal had no such problem at the recent wedding of Pamela and Jesse Sargent. The bride is a friend of actress Emilie Livingston, who recently became engaged to Jeff Goldblum—and brought him along. And because, like God, Jeff Goldblum is patient, and Jeff Goldblum is kind, he agreed to participate in this silly photo op, instead of just saying, “No thanks,” giving one of those massive grins of his and going back to his dinner. Looking at the picture, it’s kind of amazing how the actor manages to draw the eye even more effectively than the CGI-monster behind him, all while simultaneously giving a master class on how run in a suit without looking like a goober.